It's a question we all ponder, but for folks looking to settle down and establish roots, it's all about place. Neighborhood is everything and to help those searching for the right match, this Fresh Water series explores Cleveland locales that are primed for growth. In this edition, writer Erin O'Brien uncovers the burgeoning Campus District. Spanning from the Shoreway to Orange Avenue between East 30th and 18th Streets, the Campus District covers a scant square mile of incredibly diverse territory that is bursting with more than $260 million in development, both public and private. Investors are preemptively snapping up properties for residential and commercial projects as this neighborhood transforms with each passing day. Urban, connected and on the move, the Campus District is poised to take off in ways old time Clevelanders never could have imagined—and then some. For anyone in the market for an urban address, the options within the Campus District are about to explode. The largest effort will be the Cuyahoga Metropolitan Housing Authority's (CMHA) ambitious Cedar Redevelopment project. “This will have a vast, positive impact on the Central Choice community,” says CMHA chief executive officer Jeffery Patterson of the $178 million effort, which will unfold via four phases on a 15-acre area adjacent to East 30th Street between Central and Community College Avenues. While phases three and four are still in planning, phase one, a four-story building with 60 one-bedroom units, will be complete in fall 2016. Phase two, 50 one- to four-bedroom town homes, will be complete in spring 2017. Groundbreaking for the mixed income units is scheduled for next month. The city has also slated $5 million to divide the sprawling area into smaller, friendlier sections with new streets. "Instead of a megablock," says Campus District Inc. executive director Bobbie Reichtell, "it will just be regular streets." Located in the southeast quadrant of the district, the project will balance the significant residential options to the north, such as as the Langston on Chester, 2320 Lofts on Superior and the Walker Weeks building on Prospect, which used to be home to the offices of the legendary Cleveland architects of the same name. 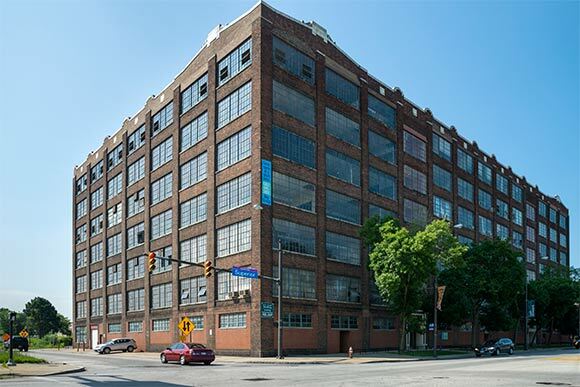 The forthcoming $7 million redevelopment of the 1917 Stuyvesant Motor Company Building on Prospect, which last month was awarded an Ohio historic-preservation tax credit, will transform the former City Blue building into 40 market-rate apartments. The Domain, formerly the YMCA Building on Prospect, is also slated for a major renovation. While not residential, perhaps one of the most telling projects in the district will unfold at the Artcraft Building on Superior, which real estate developer Global X is scheduled to transform into Class B+ offices over the next year. The parcel is one of many the organization is amassing along the district's Superior Avenue corridor. "We see it as the next development hotbed, says Global X's chief investment officer Timm Judson. "It's one of the last great wide avenues that hasn't received much attention and frankly, the pricing there is fairly low, so we want to take advantage of that." While there are no specific plans beyond the Artcraft renovation, Judson says mixed-use and residential development, including student housing, are on the table for the vacant lots and four remaining structures the company has scooped up. So what's behind the surge in the Campus District development? Reichtell cites the tremendous success of downtown housing with occupancy rates nearing 97 and 98 percent. "That shows the supply is not meeting the demand," she says, adding that the Euclid Avenue Healthline is another game changer. "It has really made it possible for Case and medical students to live in the Campus District and quickly commute over to University Circle," she says. Lower rents than those in other downtown districts make the area that much more attractive. Lastly, Reichtell notes the efforts of Cleveland State University's (CSU), two presidents, Michael Schwartz (2002-2009) and his successor Dr. Ronald Berkman (sitting) that have elevated the school's image academically and physically with higher admission standards and student residential projects such as Euclid Commons and Fenn Tower. All of this culminates to attract the most important component of any neighborhood: people. 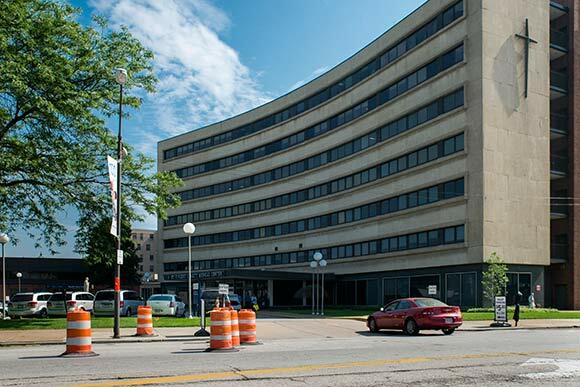 While talk bubbles around a multi-million dollar capital campaign unfolding at the main campus of Cuyahoga Community College (Tri-C), mouths are mum on details until the relevant parties formally approve the plan as early as next month. Reichtell did offer up a tease, saying that Tri-C will endeavor to "open its doors both physically and in terms of engagement with the community," with a focus on the East 30th Street corridor. The effort will tackle architectural relics from decades past. "The 60s era buildings almost had a prison style," says Reichtell of some of the hulking buildings associated with Tri-C and CSU, "almost as if to protect the buildings from the surrounding community." The transformation is already well underway at CSU, where as funding strategies for a master plan advance, other pivotal projects are coming to fruition, starting with the $45 million Center for Innovation in Medical Professions (CIMP) building. "I don't think the Holiday Inn/Viking hall was representative of what we want the campus to project," quips CSU president Ronald Berkman, referring to the notorious eyesore that once stood on the prominent CIMP site, which is bordered by Euclid and Prospect Avenues and East 21st and 22nd Streets. "It is obviously a very very significant physical improvement. It happens to be just an extraordinary building as well," he says, noting that it will promote a new model for health care professionals that focuses on interdisciplinary clinical training across the profession. "We have never had a structure that represents and consolidates all of the work we're doing in health care," says Berkman, adding the move is important in a city where health care is a major economic generator. Classes at CIMP will commence next month. To the north on Payne Avenue and East 22nd Street in what is now a parking lot, the new $21.4 million kindergarten through eighth grade Campus International School, which is a unique collaboration between CSU and the Cleveland Metropolitan School District (CMSD), is scheduled to open in fall 2017. Coveted admission slots for the school are issued via lottery, with certain percentages reserved for children of CSU faculty and students outside of Cleveland. The school, which is adding a grade per year, is currently housed in the Cole Building at 30th and Chester, which will eventually house the Campus International high school. "One of the initial reasons for developing Campus International was a hope that it would be a catalyst to grow the Campus District neighborhood," says Berkman. "A number of people from the district are sending their kids there." "It's one of the best kept secrets of Cleveland schools," adds Reichtell of the school, which boasts an International Baccalaureate curriculum. 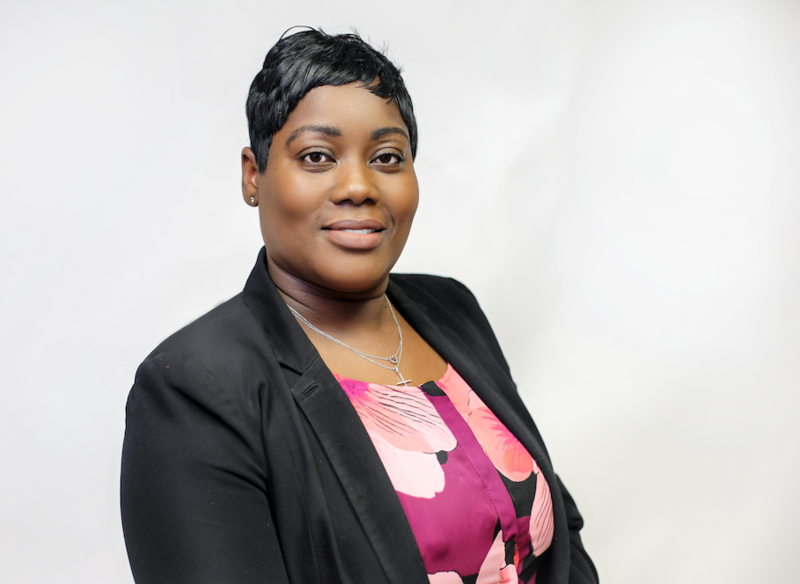 Aside from the formidable anchors of Tri-C and CSU, Campus International joins a small circle of alternative educational venues within the district, including the junior and senior programs for CMSD's MC2STEM high school and manufacturing incubator MAGNET. All of them inherently boost the Campus District's vibrancy by putting "feet on the street," as Berkman describes it. "Having individuals on the street in any urban neighborhood is extraordinarily important for the development of that neighborhood," he says. "The university is a natural accelerator for it." Long before the Campus District was a district and 100 years before Cleveland State University made the scene, St. Vincent Charity Medical Center was established on East 22nd Street. "We have been called the downtown hospital for I don't even know how many years," says St. Vincent's vice president of marketing and communications Wendy Hoke. Like Tri-C, St. Vincent is finalizing plans for a major capital investment with an announcement expected in September. Until then, the health care mainstay is ready for the residents that will populate all that new housing, with an emergency room that that sees some 30,000 patients per year and a Fast Track Service that speeds those with less severe injuries (cuts, scrapes, ear infections) in and out of the hospital in 90 minutes. "It's truly invigorating to be able to serve a downtown population," says Hoke. "We take care of them." The hospital connects to the district at large in other ways. It is one of the training locations for the NEOMED-CSU Partnership on Urban Health. St Vincent also sponsors events such as community lunches, the Campus District Spring Clean Up and annual drives to amass school supplies for neighborhood kids. "We're all quite interconnected," says Hoke. Another neighbor to whom St. Vincent lends a hand is the Norma Herr Women’s Shelter on Payne Avenue. Every year they collect personal care items for about 175 women. 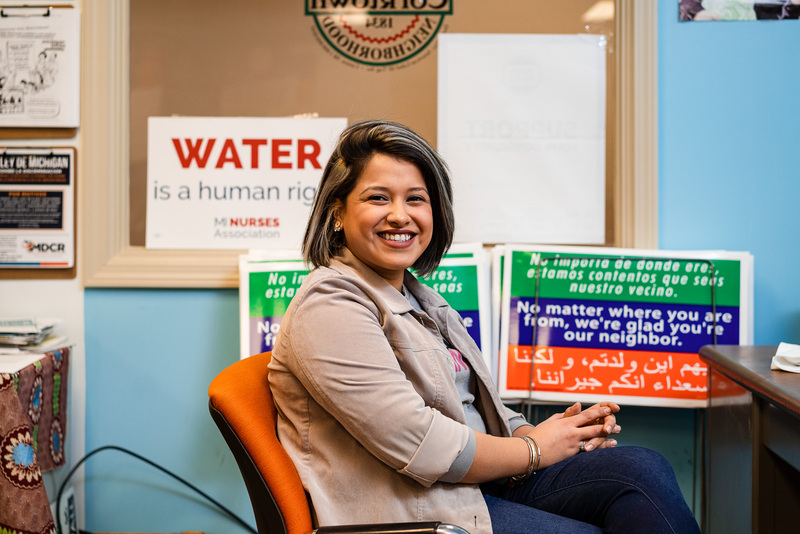 Norma Herr, along with North Point Transitional Housing, is under the wing of Front Line Services, one of the organizations within the district that caters to the most vulnerable among us. Also in the district are the Bishop William M. Cosgrove Center and the largest homeless shelter in the state, Lutheran Metropolitan Ministry's Men's Shelter at 2100 Lakeside. "Something we've learned in working with a lot of people in the shelters is that we have a narrow view of homelessness and what it means," says Kaela Geschke, community organizer for the Campus District Inc. "There are so many different types of people experiencing the shelters and using services. They're genuinely interested in being part of the community," she adds of those who populate these neighborhood assets. "They're willing to give." They also join a richly diverse neighborhood that includes international students from across the globe, artists and young professionals, all of whom Geschke endeavors to connect via monthly gatherings and a host of grassroots projects. Dan Jakubisin, resident and part-time manager of 2320 Lofts has jumped into all of it with both feet. 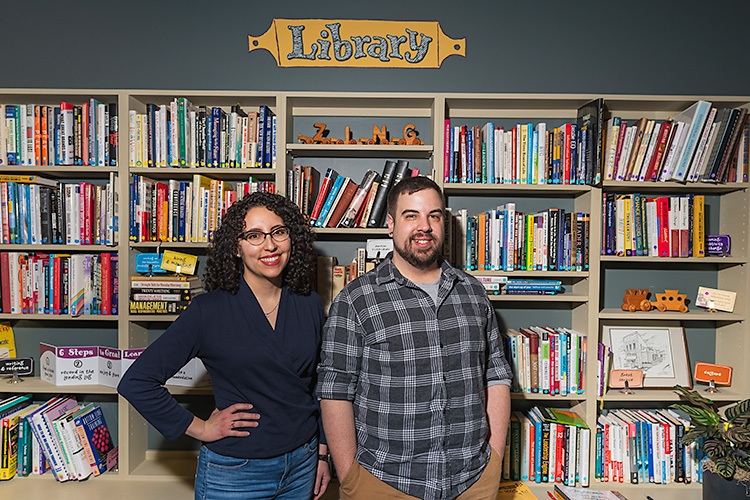 "The amazing folks at Campus District have organized the Superior Initiative," says Jakubisin, "which is a growing resident-driven community development coalition." He's joined one committee that's examining the public art and landscaping on Superior, helped complete a Treelawn Takeover in front of the Tower Press building and is volunteering at tomorrow's Night Market. 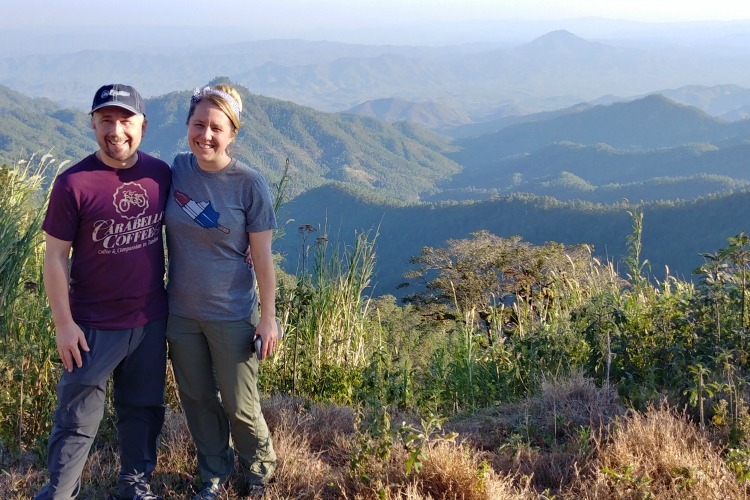 "The community projects not only accomplish both the small and large objectives within the scope of the initiatives," says Jakubisin, "they have the additional benefit of really bringing the people together." The Campus District has its share of ongoing road construction headaches along East 22nd Street and Community College Avenue. But area players are willing to endure for the payoff: new streetscapes, bike lanes and smooth pavement. "We'll put up with the orange barrels in the name of progress," says Wendy Hoke of St. Vincent. Until then, perhaps a walking tour is in order. After all, the Campus District has its share of glittering gems, starting with a Buddhist Temple amid the beautiful and historic remnant of Cleveland's Chinatown on Rockwell Avenue between East 21st and 24th Streets, which is also the site of the new Night Market festivities. Or take in some cutting edge art at the William Busta Gallery, 2731 Prospect, or at Cleveland Print Room, 2550 Superior. 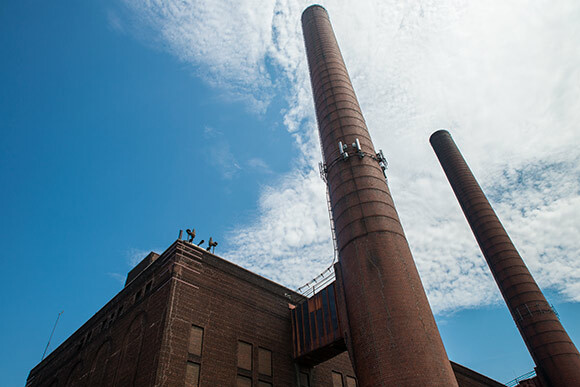 For an active piece of history, there are the towering smokestacks of Cleveland Thermal, 1921 Hamilton Avenue, which has supplied steam heat to area buildings since 1894. Daffy Dan has two buildings up for sale on Superior, where his goofy cartoon images still festoon their exteriors. The Norton Furniture building, 2106 Payne, isn't nearly as quirky as the company's commercials, but worthy of a wink. Or you could search for the five single-family homes tucked into the district and the two Crossfits. The old Juvenile Court Complex on East 22nd Street is a fascinating structure that's inactive now but not for long. "They're not in your face," says Kaela Geschke of the district's charms. "You have to search for them. I think there's really something exciting about that." 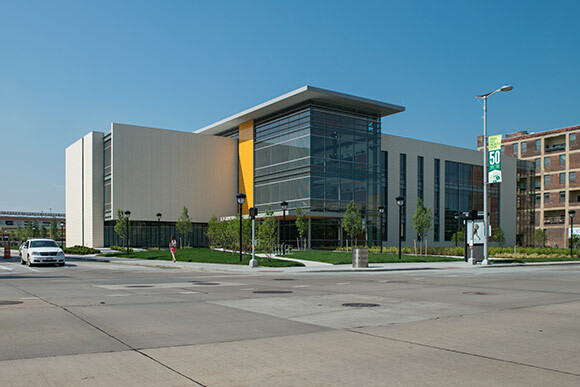 A few tips for prospective residents: the Stephanie Tubbs Jones Transit Center is now Cleveland's Megabus stop; nearby grocery options include Dave's, 3301 Payne Avenue, and Heinen's, 900 Euclid Avenue, and, lastly, CSU offers surrounding community members affordable access to its recreation facilities.